Use this pre-deployment guide to review and determine your ideal Host settings. You have a range of options! The Proxy Host client can be configured with wide range of settings combinations to suit your company’s needs, including defining multiple host configurations for every different endpoint group. Below are the main settings categories that you need to consider. The default connection behavior of the Proxy Host is to “click & connect” and “get right in”. For environments that require end-user approval for all connections, we have two options: Grant and Request access. 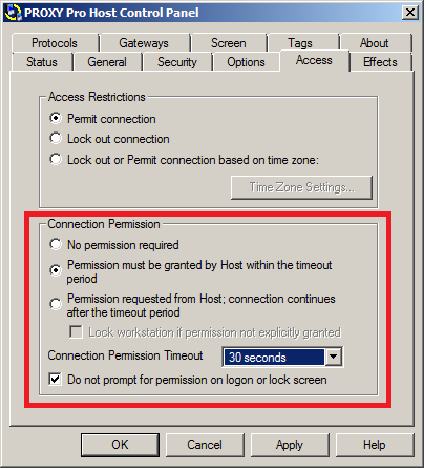 Also note that there is a “Bypass Connection Permission” override option available which will allow for immediate access regardless of the access setting selected. 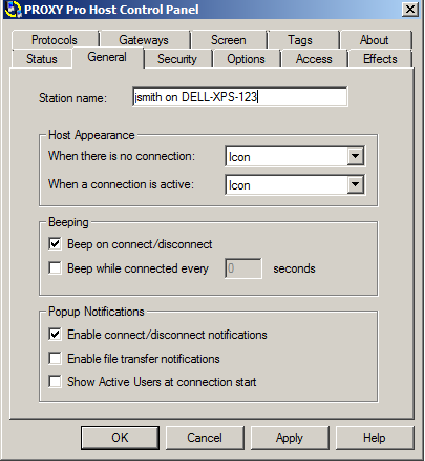 When set to Grant, Proxy Networks can either connect to the machine as it was left, or can lock the Host workstation upon connection, which would require the connected user to log into Windows before using the machine. Thinking about the end-point user consider the following options and which are best suited for your specific environment. Tray Icon – The tray icon can be hidden at all times, visible at all times, or visible only during connections. Connection Notification – Turn on or off the pop-up message in lower-right hand corner of the screen indicating the identity of users connecting/disconnecting. And, optionally, end users can be notified when a File Transfers occurs. Beep on Connect/Disconnect – Enable or disable audible connection beeps (disable for Stealth Mode). Customer administrators don’t always like their current end-point naming conventions, so the Proxy Host machines can be configured to present themselves to you in a variety of ways. Consider how you would prefer your host machines should be listed in your console. Whether it is by computer name, user name, domain or user full user name, think about how you would want to search for your specified host machines. 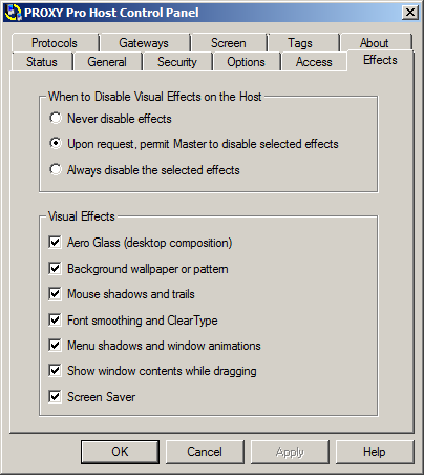 By default, a Proxy Host machine allows the connected user to enable or disable chosen effects. Some customers require stealth mode where effects are never disabled and some customers always have the background disabled to speed up connection time. Always Disable - Certain effects can be disabled for all connections, such as the wallpaper, which can speed up the initial connection timeThe default setting is "Upon Request", allowing the technician to determine what effects he or she wants enabled/disabled during the remote session. 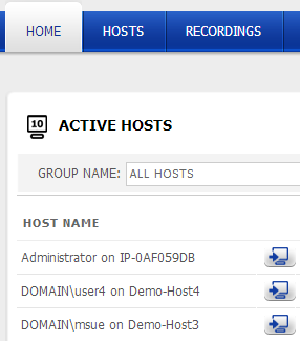 On any given machine, members of the local administrators group will have Full Control / Administration over the Proxy Host Control Panel by default. If your end users are not local administrators, no special instructions here apply. There are two ways to lock down the Host machine depending on your environment. Windows Authentication - Ideal for any modern Windows Active Directory Domain environment. If end users are not local Administrators, but your IT Administrators are, no special instructions apply. Simple Password - Ideal for Proxy Host machines that will not be joined to your domain. The Proxy Host Control Panel can be "password protected", meaning that a password would be required to view / edit Proxy Host settings. For a complete listing of all available Proxy Host-side settings, including additional "Station Name" values and more, please visit the Proxy Host Manual PDF included in any Proxy Networks software zip file. The Proxy Networks Support Team would like to ensure a smooth deployment and operation of Proxy Networks software for all our customers and you are welcome to check with us at any point for help, guidance, best practices and training. For technical assistance, write to support@proxynetworks.com, submit a ticket at proxynetworks.com or give our Support Line a call at 617-453-2710 for any immediate issues or questions.